The paper starts with a discussion of the development of the number of manufacturing sector jobs in the framework of economic transformation and industrial restructuring in Central and Eastern Europe. Over the past decade, domestically-owned manufacturing companies reduced the number employed while foreign-owned enterprises expanded that number. Job losses due to FDI have resulted from restructuring of privatized state-owned companies. A reduction of employment has also resulted from foreign companies cutting domestic supplier linkages after taking over state-owned enterprises. A database with indicators of foreign affiliates allows to identify countries and industries with various levels of foreign penetration and employment development. Foreign affiliates show higher labour productivity and better capital endowment and use more up-to-date technology than domestic companies; as a result, they tend to increase the performance in the host economy as a whole. Ownership-specific differences in productivity are clearly reflected in relative wages. Young skilled workers employed by foreign enterprises have higher wages relative to both their unskilled and skilled older colleagues and also relative to their counterparts in domestic firms. The more efficient matching of new technologies and new skills in foreign than domestic enterprises has benefited younger generations. A major question for the future is whether the present high regional concentration of FDI within the countries is likely to diminish. Agglomeration effects work against this happening, while improvements in transport and telecommunications make it more feasible. Thus, for instance, larger towns in peripheral regions have started receiving more FDI after becoming accessible by motorway. In the second part of the paper, empirical results from a gravity model are discussed; these suggest that FDI in non-manufacturing sectors tends to be of a horizontal type, while this is less the case in manufacturing. With a modest pace of convergence towards the level of GDP per head in the EU-15, non-manufacturing FDI is likely to remain constant or even decline, except in the Czech Republic, where non-manufacturing FDI would grow at a similar rate as in manufacturing. With stronger convergence, FDI in non-manufacturing is likely to show more robust growth. Further econometric analysis suggests that FDI is a significant determinant of the skill composition in the new EU members and is biased against skilled manual workers (i.e. 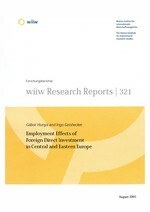 FDI results in more employment of high-skill non-manual workers and low-skill workers). The magnitude of this effect is, however, modest and partly offset by other factors.